The Fuller Center for Housing’s mission is simple: We are doing God’s work by partnering with people to help them obtain simple, decent, affordable housing, empowering them to gain a better life with the hand up that home ownership provides. It’s a simple concept and a simple operation. We are not bogged down by top-down directives. We don’t hold covenant partners’ hands. We don’t have lavish headquarters. Our operational costs are kept to a minimum. We just want to put people in decent houses. We get things done. Period. Today was an excellent example of just how frugal some of us at The Fuller Center’s headquarters — me — can be. I’ve been called frugal, indeed, although more often I’ve been called cheap. (Just last night, my wife and I argued over whether to spend $2 or $8 on a deck post cap. I won, believe it or not! We spent $2, and even that was a pain for me to part with.) And, today, it was up to me to throw the birthday celebration for our graphics designer Richard Aguirre. So, I got Richard a cake. Actually, two cakes. Little Debbie cupcakes, that is. I forked out 99 cents of my own hard-earned money for those two cakes. 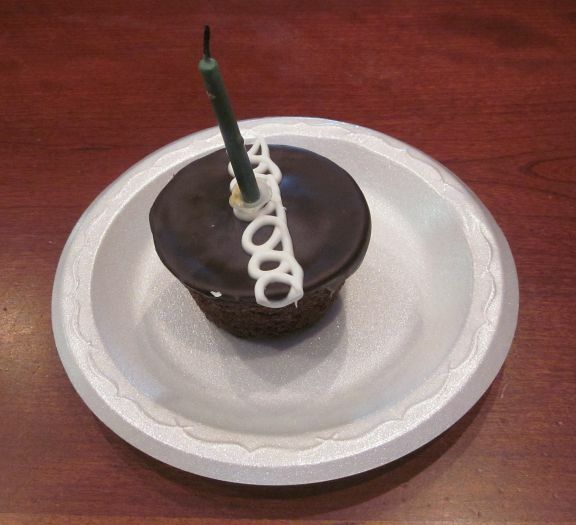 (Actually, I only put a candle in one of the cupcakes for Richard, and the other is in my desk drawer. Don’t tell Richard!) This was a well-thought-out celebration on my part as planning for this event began about 10:47 a.m. Richard and I have an 11 a.m. meeting every Thursday to discuss visual projects, so thankfully that left me 13 minutes of party planning … more than enough time for an experienced party planner like myself. 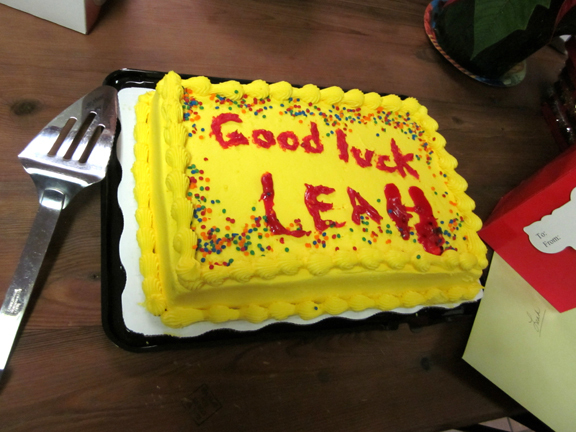 The last time I was put in charge of a cake here was when my then-assistant Leah left for another opportunity, and while I forked out several dollars for a cake, I did skimp on the decorating by doing it myself, and I think you can see from this photo what a wise decision that was. Someone commented that you get what you pay for. And you get what you pay for when you donate to The Fuller Center. We designate your money wisely because you believe everyone deserves a simple, decent place to live — and we do, too. Just go to our latest news to see all the activity. We’re mighty busy for a simple operation. It’s also very easy to donate. You can make one-time donations, support the Bicycle Adventure, donate a vehicle, make a planned gift or become a monthly donor as I am. And if a “cheap” guy like myself is willing to make a monthly donation, you know we’re using your hard-earned dollars wisely. Of course, I’m an insider here so I know the money is used wisely. And not only do we have low overhead and very cost-efficient methods of putting people in houses, but we only partner with families who are willing to contribute sweat equity and pay it forward to help put other families in decent homes. In my humble opinion, it just feels better to donate to an organization that helps people help themselves. The saying “We give a hand up, not a handout” is not a cliché here. It’s how we do things. 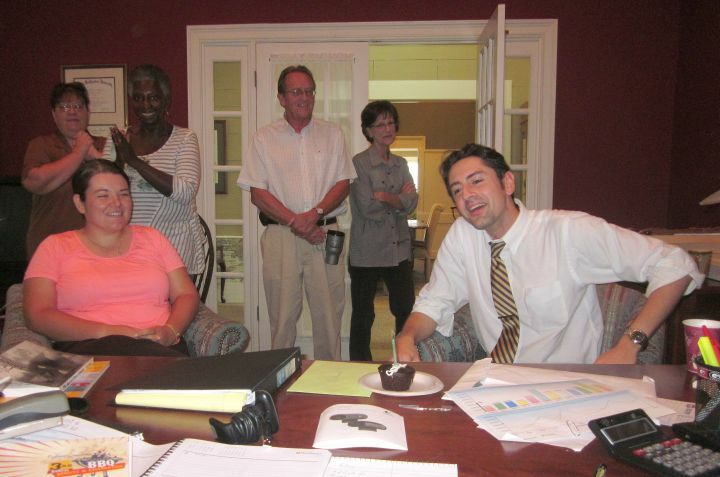 By the way, Alyssa Hostetler, the director of our Americus-Sumter covenant partner who works out of our very basic international headquarters here in Americus, upstaged me by bringing in angel food cake and strawberries after the cupcake birthday party in my office. But Richard, don’t be swayed by Alyssa’s lavish dessert offering. My offering, while small, truly came from the heart … and the Chevron up the street.